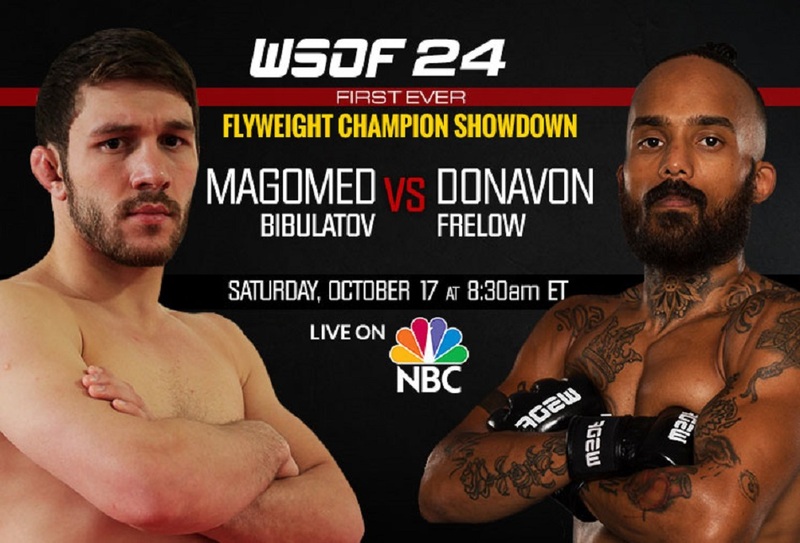 Live on NBCSN from Foxwoods Resort Casino in Mashantucket, Conn.
LAS VEGAS (Sept. 29, 2015) –World Series of Fighting (WSOF.com) announced today that it will crown its first flyweight (125 pounds) champion in history – the winner of a matchup between undefeated, surging stars Magomed “Gladiator” Bibulatov and Donavon Frelow – at Foxwoods Resort Casino in Mashantucket, Conn. on Saturday, Oct. 17, live on NBCSN at 8:30 p.m. ET/5:30 p.m. PT. The bout represents one of two world championship matchups that will unfold at “WSOF 24: Fitch vs. Okami,” the second being a previously announced heavyweight championship contest between reigning kingpin Blagoy Ivanov (12-1) of Sofia, Bulgaria and challenger Derek “Caveman” Mehman (19-6) of Cedar Rapids, Iowa. “We are looking forward to crowning the first champion ever in our fast-growing and highly-competitive flyweight division, on October 17,” said World Series of Fighting President Ray Sefo. The fight marks the U.S. debut of the 27-year-old Bibulatov (9-0) of Grozny, Chechnya Russia, following a perfect, two-year run competing against opponents in his homeland as well as in France and Portugal, eventually earning the coveted, number one ranking in his weight class in Europe. Bibulatov, a practitioner of martial arts, including sambo and wrestling, since his early youth, remains the only fighter to have beaten UFC star Taylor Lapilus, over whom Bibulatov earned a unanimous decision on October 12, 2013 in the main event of a fight card held in Lapilus’ home country of France. In his last start on March 14, Bibulatov scored a first round (1:30) KO (punch) on Eduardo Felipe in co-main event action in Bibulatov’s hometown of Grozny. A member of MMA legend Wanderlei Silva’s vaunted, Las-Vegas based fight team, the 30-year-old Frelow (5-0) has notched four of his five professional career victories, thus far, by way of submission. Following a near-perfect amateur career that saw him amass an overall record of 5-1 between April 2011 and October 2013, Frelow accepted his first pro fight on just four days’ notice and at the flyweight limit of 125 pounds, 10 pounds lower than that he had previously been competing at. Frelow persevered in his first pro start, though, defeating George Garcia by way of submission (guillotine choke) in the second round (:30) of their bout on March 6, 2014. In his third pro outing on December 20, 2014, Frelow needed only 25 seconds to submit Donald Belcher with an armbar. Frelow has since recorded two straight wins in the World Series of Fighting decagon cage. In the welterweight main event, Jon Fitch (26-7-1, 1 NC) of Fort Wayne, Ind. will face rival superstar and grappling technician Yushin “Thunder” Okami (30-9) of Kawasaki, Kanagawa, Japan. Doors at the Grand Theater at Foxwoods Resort Casino will open at 4:30 p.m. ET for WSOF 24, and the first preliminary card bout will begin at 5:30 p.m. The entire preliminary fight card will stream live on an embeddable video player on WSOF.com. The card is subject to change.